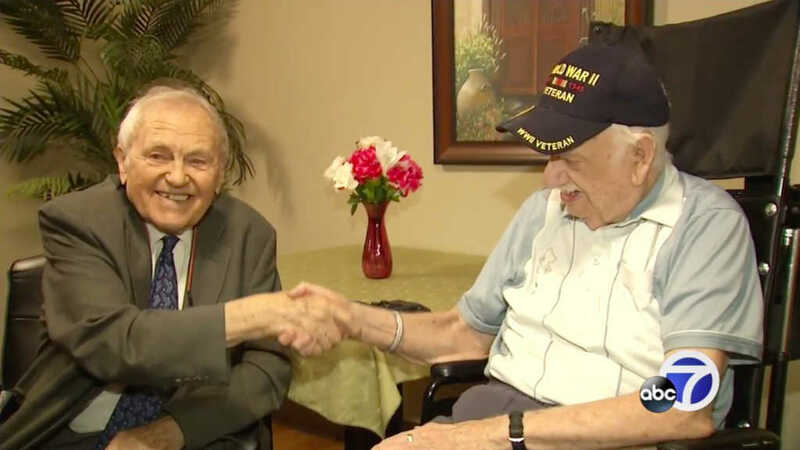 Two California men who together share a pivotal point in World War II history reunited on Monday after more than seven decades. For the first time since the Holocaust, Nick Hope met with the American man who liberated him from the Dachau Nazi concentration camp in Germany, WABC-TV reported. The two were barely 20 years old when they first met. At the time, Hope was wearing a badge that stated his prisoner number – not his name – that showed he was assigned to work at a factory at the camp. At least 30,000 Jews died at Dachau before it was liberated by American soldiers on April 29, 1945. Veteran Henry Stuehmeyer doesn’t like to talk about the horrific experience much. On Monday, Hope, Stuehmeyer and their families gathered together at a Holocaust memorial in Peteluma, California, where they shared memories and mementos, and Hope offered his gratitude to his savior. In a serendipitous meeting at the memorial the year before, Hope and Stuehmeyer’s sons discovered that their fathers lived just miles away from each other – one in Calistoga, and the other in Petaluma. Now, the two men can continue their very special friendship that was founded on freedom, and of course, hope.